This biscotti proves that cultural exchange leads to enrichment for us all! 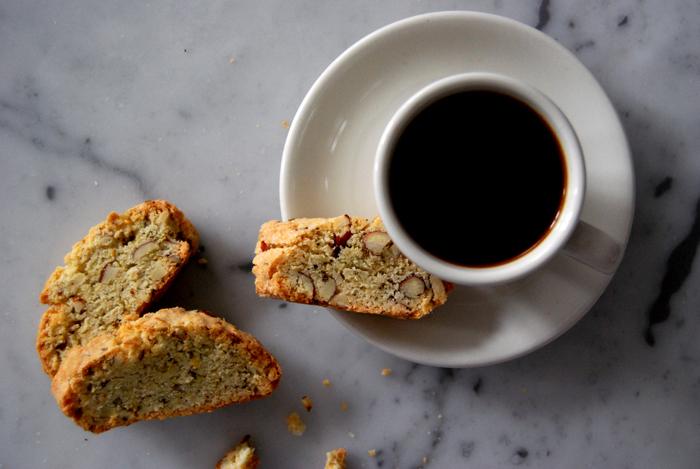 Originally, biscotti are from Prato in Tuscany. Also known as cantuccini, they are baked twice and filled with almonds. 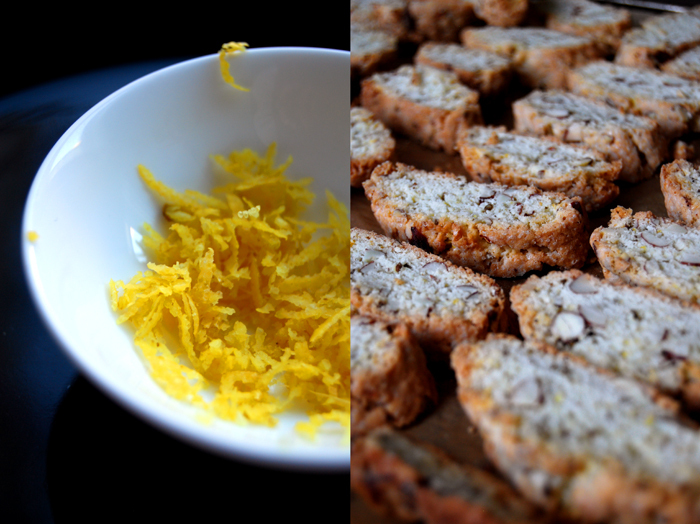 So far, my biscotti stuck to tradition but today I enhance them with a shot of Ouzo, the famous Greek aniseed spirit. The result is a mouth-watering Italian-Greek union! I add some aniseed to the dough and their taste comes through so much stronger thanks to the Ouzo. Together with the almonds and some lemon zest each crunchy bite creates an explosion on your taste buds! My aunt Ursula told me about the Ouzo-biscotti combination and at first I had my reservations, but that soon changed! I have my biscotti with an espresso at lunch time as a delicious energy booster but they are also a great dessert with ice cream or custard. You could follow the Italian tradition and dip them in Vin Santo – or continue the Greek variation and enjoy them with a shot of chilled Ouzo! Set your oven to 180°C / 355°F and prepare a baking sheet with parchment paper. Combine the dry ingredients (except the almonds and lemon zest) in a bowl. In a second bowl, mix the butter with the eggs, lemon zest and Ouzo for a couple minutes. Mix the dry mixture into the butter mixture with a spoon. Add the chopped almonds carefully. Divide the dough into four parts and form each into a long bread shape (around 5cm / 2″ wide). Place them on your baking sheet and bake for 25 minutes. Take them out and let them cool off for around 20 minutes. Turn your oven down to 170°C / 340°F. For the second round, cut each loaf carefully in 1.5cm / 1/2″ slices and lay them flat on the baking sheet. 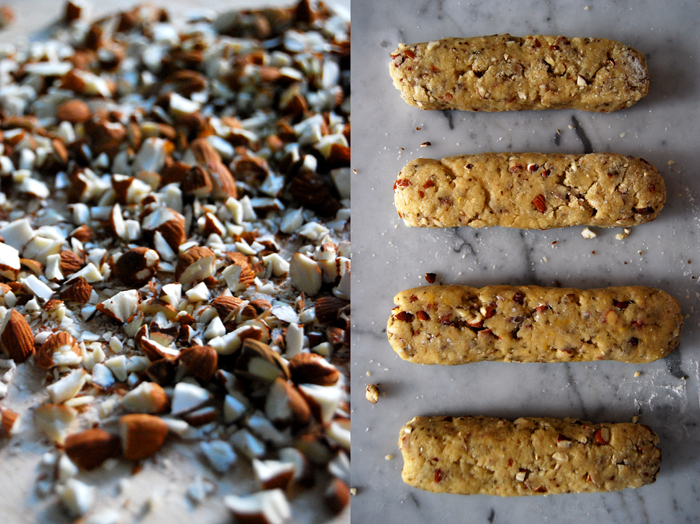 Bake for 6 minutes, turn the biscotti over and bake for another 6 minutes. 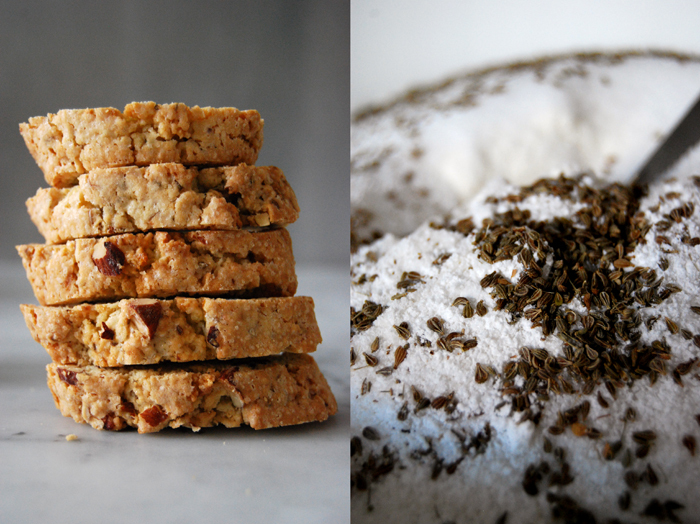 Take the biscotti out when they turn golden and let them cool.